No compromises. Made for performance. When you lack micronutrients like zinc and magnesium, your everyday performance can be compromised.The result: fatigue and lapses in concentration. We all need an adequate supplyof minerals to perform at our best, both at work or at the gym. Nutritional values per serving (3 capsules). The distinguishing feature of our Zn:Mg is its excellent formula. The unique combination of magnesium glycinate, zinc gluconate, and malic acid covers your daily requirements with ease. No compromises. Our Zn:Mg contains only the finest raw materials. We rely onthe perfect interaction between magnesium carbonate and zinc oxide toguarantee the quality and effect of our Zn:Mg supplement. These two substanceshave high bioavailability. The bioavailability indicates how quickly and towhat extent a nutrient found in food can be absorbed by the body. The faster anutrient is absorbed, the faster the body can put it to work. Our Zn:Mg. In a class of its own. Dietary supplement with magnesium and zinc. Take 3 capsules on an empty stomach before bed. Take no less than 2 hours after your last meal. Don't combine with dairy products. Magnesium deficiency is one of the most common causes of cramping during exercise. You can preven tthis by taking a magnesium supplement. great product. feeling fit, strong and healthy. I clearly have less muscle cramps after taking these. In addition to that, I feel less tired. Perfect.I finally found this nice product for vegans. I like! Zinc and magnesium (Zn: Mg) combined with vitamin B6 and malic acid is a dietary supplement used primarily by strength and endurance athletes. Through everyday stress and physical training high demands are placed on our body. Taking Zn:Mg can help to counteract a mineral deficiency and support physical performance. Transport matrix - malic acid as an "active ingredient booster"
Zn:Mg plays a key role in our body's regeneration. Be it intense physical workouts or a stressful day at the office, our body requires recovery periods in order to regenerate. A zinc and magnesium deficiency can significantly disrupt these vital recovery periods. This can result in anything from frequent fatigue and regular headaches to muscle cramps. Taking Zn:Mg on a daily basis can compensate for a possible mineral deficiency and support regeneration processes in the body. As can a long and deep sleep. Fully charging the batteries is the best way to help muscles regenerate after an intense workout. In order to understand the effects of Zn:Mg, we must first break it down into its main components; zinc, magnesium, malic acid and vitamin B6. Zinc is an essential mineral with antioxidant properties, which supports the effect of many enzymes in the body. These enzymes control a large number of biochemical processes in our body. Among other things, zinc is involved in protein biosynthesis, which has been shown to be responsible for muscle growth and recovery. Zinc also plays a central role in our immune system. Magnesium is also an essential mineral which is important for metabolic functions and the health of our bones. Magnesium is especially important for athletes because it actively supports muscle performance and regeneration processes. The use of vitamin B6 and malic acid gives our zinc and magnesium a unique transport matrix which acts as an "active ingredient booster", improving the absorption in the body. A sufficient supply of zinc and magnesium plays an important role for athletes in particular. We lose important minerals, like magnesium, through sweat and physical stress. As a mineral, magnesium is essential to energy metabolism and athletic performance. Magnesium can be purchased as a supportive measure, to prevent mineral deficiency in athletes. Daily Zn:Mg is a supplement both for amateur athletes (fitness, football, jogging) and professional athletes and is suitable for all goals: Improving regeneration, overall performance, muscle building or weight loss. The importance of taking Zn:Mg for everyday life should not be underestimated. Constant stress combined with an unbalanced diet can quickly lead to a deficit in essential minerals. The result: reduced efficiency at work. Aspects of training like regeneration and muscle growth are also decisively influenced through Zn:Mg supplementation. Zn:Mg should always be consumed in the evening before bed. It is important to take the supplement on an empty stomach and with plenty of fluids - take no less than 2 hours after your last meal. Do not consume any foods containing calcium, especially dairy products, with Zn:Mg or directly after taking Zn:Mg as these can jeopardise the efficacy of the supplement. Calcium blocks the absorption of Zn:Mg in the body, which in turn limits the efficacy. For an optimised effect, take three Zn:Mg capsules immediately before bed on an empty stomach. This corresponds to 375 mg of magnesium and 20 mg of zinc. If you follow the recommended intake, you need not worry about any side effects. Should an overdose occur, side effects like diarrhoea and nausea can arise. The active formula of Zn:Mg is based on four natural components; zinc, magnesium, malic acid and vitamin B6. This eliminates the risk of side effects caused by artificial additives. There are some important criteria to consider before buying zinc and magnesium (Zn:Mg). Nowadays supermarkets, gyms and pharmacies offer a wide range of zinc and magnesium supplements, which vary greatly in price. There are a lot of suppliers on the market who offer cheap imitations of zinc and magnesium and try to undercut the high-quality products by price dumping. These imitation products use inferior ingredients and insufficient dosages of the active substances. This means the Zn:Mg formula simply cannot be effective. The pharmaceutical form of the individual components zinc and magnesium is crucial. High-quality Zn:Mg should come in a purely plant-based capsule. 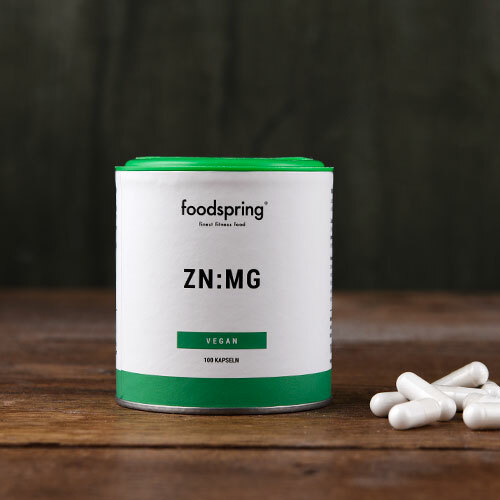 foodspring's zinc and magnesium comes in vegan cellulose capsules, which represents an important contribution to sustainability. Zinc and magnesium is often offered in conjunction with carbonate or oxide. Carbonates are inorganic compounds, which are largely destroyed by the gastric acid and cannot supply the body with "real" magnesium and/or zinc. Zinc and magnesium compounds with salts like citrate, the amino acid glycine, chloride or gluconate provide better bioavailability and solubility in water. So the correct composition of the Zn:Mg is crucial. You can buy high-quality Zn:Mg with zinc gluconate and magnesium glycinate from Germany right here in the foodspring online shop. How good is the bioavailability of Zn:Mg? We only use compounds with the highest bioavailability for our zinc and magnesium combo product, namely magnesium glycinate and zinc gluconate. Why should I use foodspring Zn:Mg? We’ve taken the well-known ZMA zinc and magnesium formula and perfected it by incorporating the malic acid transport matrix. As a result, our product provides you with the highest bioavailability without any side effects. Why do you use vegan capsule shells? Our capsule shells are made of 100% natural, renewable cellulose. We are opposed to the use of cheap capsule shells made of gelatine and only use quality, natural raw ingredients for both the capsule and the ingredients in it. We’re proud that our nutrient supplement is also suitable for vegetarians and vegans. The term bioavailability refers to how the body uses the food it consumes. Bioavailability indicates how quickly and to what extent substances are absorbed by the body and made available. We guarantee a particularly high bioavailability through the use of the active ingredient formula of magnesium glycinate, zinc gluconate, and malic acid. This helps your body absorb and process the nutrients without side effects or tolerance issues. Zn:Mg is suitable for anyone who trains hard or is subject to a high degree of daily physical strain. Whether on the job or on the playing field, continued exertion combined with an unbalanced diet quickly leads to a lack of essential nutrients. Athletes in particular require more zinc and magnesium due to their increased levels of physical activity and simultaneous increased mineral loss through sweating. Zn:Mg will be back in stock shortly.